'Timeless' is part of an international spec ad campaign for Chanel conceived by Feli di Giorgio. It consists of three long format shorts for internet and theatrical release from which multiple 30 or 60 second spots would be cut for broadcast and internet distribution. A print campaign based on the characters featured in the shorts would be created for magazines, billboards etc. Each of the long format spots would tell a distinct story following a common theme. They would feature a specific classic Chanel creation and serve the purpose of evoking the heritage and spirit of the company. The pilot short presented here is titled 'Timeless'. It tells the story of a woman and her prized Chanel day suit as it accompanies her over a 20 year period of her life. The two other and as of now unfilmed episodes in the trilogy are titled 'Black Swan' and 'The Gift'. 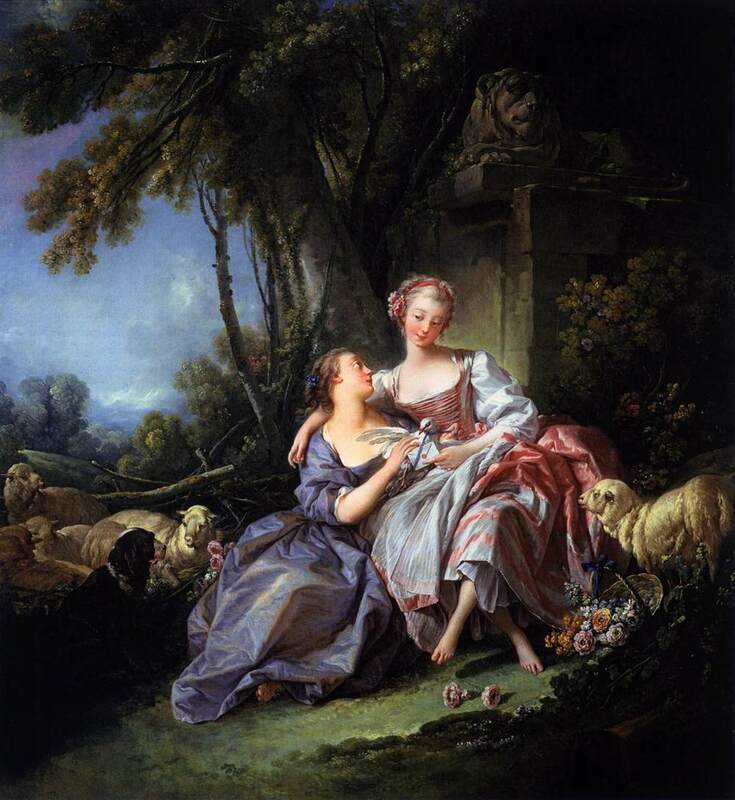 The color palette of the production is based on the work of French rococo painter François Boucher. Most notable being the prominent shades of blue found throughout his catalog of work. The blue dress worn by leading lady Karen Hall served as an anchor for the color palette of the entire production. The colors of all other costumes, props and sets were coordinated to work in harmony with this costume. In addition to Ms Hall's acting talents she was also cast for her uncanny resemblance to some of the subjects painted by François Boucher. A swatch of the blue fabric used for the hero costume along with a color wheel and sketches for sets and costumes worn by other characters. 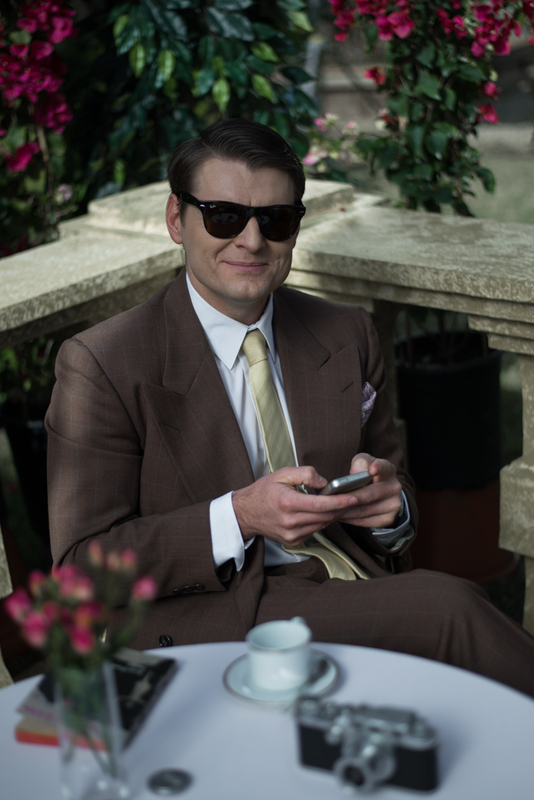 A selection of frames from Chanel 'Timeless' illustrating color across the spot. The story of Chanel 'Timeless' revolves around a blue day suit that accompanies a woman over a 20 year period of her life. The iconic day suit was introduced by Coco Chanel in the1950's. It consists of a collarless cardigan jacket featuring prominent edge piping made from braided trim or other fabric. The cut is boxy, clean and modern. The jacket is accompanied by a slimline skirt of knee length and a pair of Chanel's two tone slingback shoes with their distinct contrasting toe cap. More than a half century after its introduction the classic Chanel day suit remains popular with woman of all ages. The blue day suit featured in 'Timeless' is an original design by director Feli di Giorgio created for leading lady Karen Hall. Rather than reproducing an original Chanel creation a variation was envisioned with the intention of evoking the timeless spirit of the original design while complimenting Ms Hall's personal attributes and personality. A bespoke example of this suit was tailored specifically for Ms Hall and the production. Great attention to detail was also lavished on her accessories and accoutrements. This entailed period correct undergarments, including stockings that were reproduced by a specialty company on vintage machinery. The prominently featured straw hat dates to the early 1920s and the white elbow length kid leather gloves are vintage haute couture of French origin. The remaining costumes for the other actors and additional items for Ms Hall were purchased through various vintage shops and estate sales. 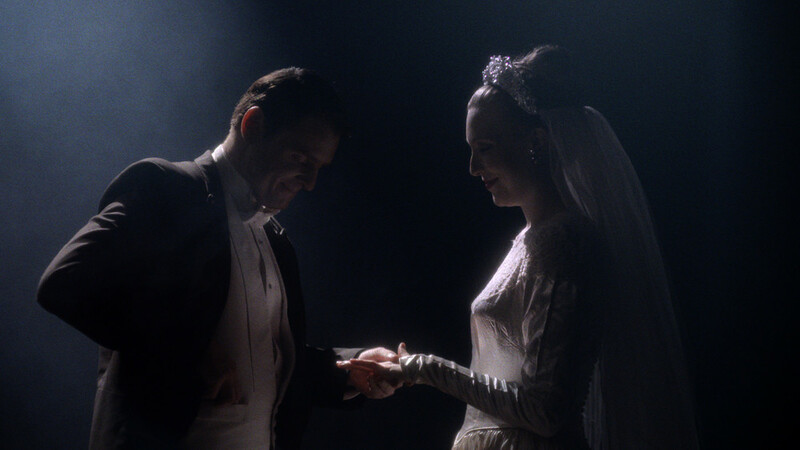 The wedding dress is an original 1930's item from Saks Fift Ave, while the suits worn by Maciek Sokalsky are from various manufacturers of the time period. All garments are period correct originals that change in style as the story progresses forward in time. Period reference material for the Chanel day suit. Karen Hall being fitted for her bespoke costume. The look of Chanel 'Timeless' is comprised of two main components; natural lighting and a digital emulation of the vintage 3-strip Technicolor process. The naturalistic lighting was achieved by director of photography Aymeric Montouchet by simulating sunlight streaming through a set of french doors and scattering off the walls of the set interior. The shadow density was kept under control by fogging the set and the judicious use of a small bounce card to simulate the light reflected by the missing fourth wall of the apartment. There were no additional lights of consequence utilized for the interior photography. "Timeless' was photographed on a Sony Cinealta PMW-F3L digital cinema camera in uncompressed 10bit RGB 444 slog with vintage Bausch + Lomb Super Baltar prime lenses. 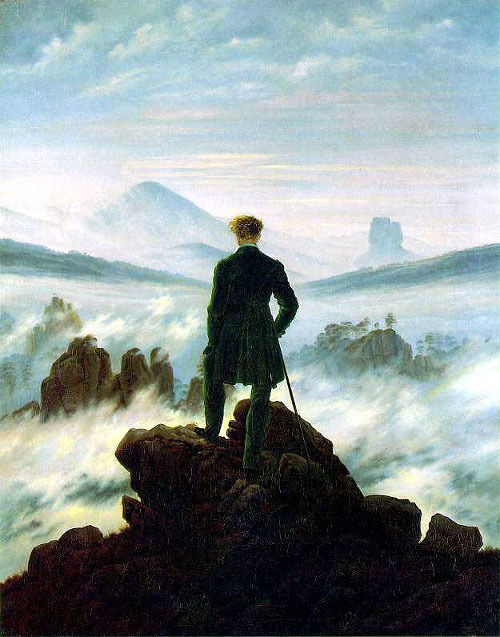 Some inspiration was taken from films as The Red Shoes, Barry Lyndon, The Duelists and various painters including François Boucher, Carl Spitzweg and Caspar David Friedrich. Bausch + Lomb Super Baltar prime lens set. Three strip Technicolor was introduced in 1932 and became the first widely used full color film process. It remained popular into the 1950's until it was supplanted by multilayer color negative technology from Agfa and Kodak that utilized a single strip of film. The three strip Technicolor process involved the simultaneous capture of the individual color components red, green and blue on three separate strips of black and white negative. For this purpose Technicolor built a special camera that contained a triple roll film magazine and pulldown movement that exposed the film through a complex prism and optical filtration system. Cyan, magenta and yellow matrices were then generated from the three original black and white negatives. These were then combined to print the final color image in a process akin to offset printing or lithography. This final step did not involve a photochemical process, but was purely mechanical. As part of the digital intermediate performed by Feli di Giorgio he also devised a 3-strip Technicolor emulator in the Nuke compositing package. Inspiration for this process was taken from the pioneering work done by visual effects supervisor Robert Legato on Martin Scorsese's film 'Aviator'. The approach taken by the emulator mimics the photographic operation of the 3-strip camera and subsequent lab and printing process. The result of this digital implementation emulates the original analog film process with an extraordinary degree of accuracy down to many of its inherent flaws and idiosyncrasies. Three strip Technicolor is by many considered to be among the most beautiful color film processes devised. It has a destinct look with strong reds, blues and dense blacks. Although the Technicolor process has been out of use for several decades it is still recognized by audiences and associated with the golden era of Hollywood between the 1930s -1950s. The production would like to thank Zoic Studios for their generous assistance in the completion of this project. Chanel 'Timeless' was completed on a shoestring budget of $16,000 dollars. Principal photography for Chanel 'Timeless' consisted of a two day stage shoot for the interiors and one shooting day on a cafe set that was constructed in the backyard of a local residence. For the apartment interiors a room was constructed on a sound stage complete with a wooden floor and a large set of french doors. This set was redressed several times to serve as the bedroom and living room of the apartment. For the cafe scene a false stone balustrade was constructed in the backyard of a Burbank residence to frame an area dressed with tables and chairs. The existing vegetation of the yard was augmented with potted plants and flowers. The scene of Karen Hall entering the park through the decorative archway was shot in Burbank and the landscape enhanced with a matte painting. 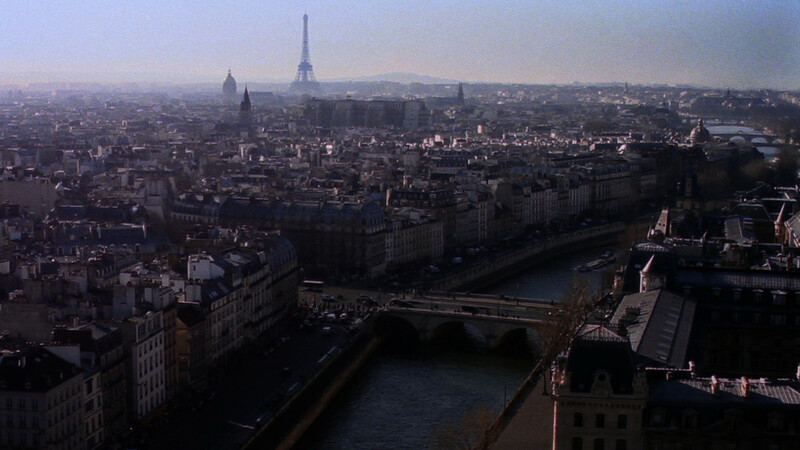 The exterior shots of Paris are courtesy of select stock footage that was digitally manipulated to remove any architecture or features that were not period correct for the production. 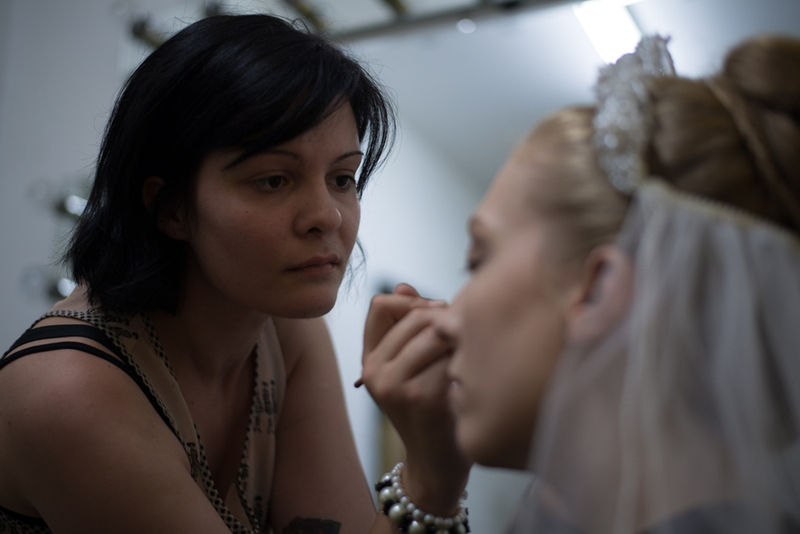 Aymeric Montouchet and Feli di Giorgio setting up a shot. The actors on the set for the birthday party.